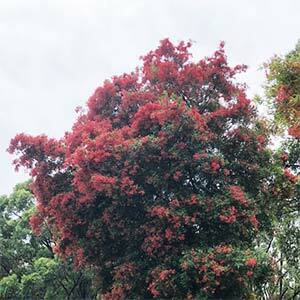 An attractive evergreen native tree, Ceratopetalum gummiferum is the New South Wales Christmas Bush a large shrub to small tree. Reaching from 3m- 5m in height and with showy flowers it make a good screening plant, very attractive to birds. This is an outstanding native tree, very colourful and free flowering. Aptly named as the creamy white or red flowers appear in December and really do put on a display in time for Christmas, they also make great cut flowers at this time of the year. In good conditions this is vigorous bushy plant. It is best in a well drained soil and a sunny position however will also grow and flower well in part shade. Dig the soil over well before planting adding a little well rotted compost to poorer soils. As these tend towards a medium to large tree in good conditions, some regular pruning is required to maintain a smaller bushy habit which is desired by most gardeners. This is a plant that can be pruned. From an early age, simply prune the whole bush back by 1/3 directly after flowering. C. gummiferum Albery’s Red – This variety has bright red flowers in summer. C. gummiferum Red, Red, Red – The flowers darken in colour as they age to a deeper red. 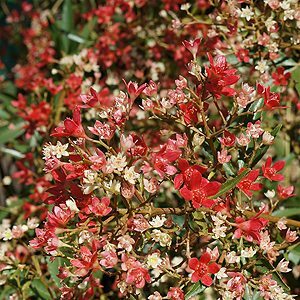 Common Name – New South Wales Christmas Bush. Height – Wil reach 7 metres in height depending on conditions. Spread – Will form a crown of 4 metres. Flowers – Mostly red, a white form does exist. Flowering period – December to February. Growth habit – Upright if grown in shade and unpruned. More spreading in full sun and with pruning.